What Can You Do to Correct Plantar Fasciitis? Any support from an orthotic, arch support, or taping in most cases should be a temporary modality while you strengthen and lengthen the tissues. Using one of these forever is akin to breaking your arm and leaving the cast on forever (in one week muscles begin to atrophy from disuse). If you have an uncorrectable structural problem a lightweight support might assist you. Doing eccentric drop down and heel raise exercises from a stair can help. Place your foot on stair and drop your heels down and then go slowly up to the ball of foot. It is OK to have a little pain doing this as long as it is getting progressively better. This helps increase ankle dorsiflexion- a common culprit for PF. 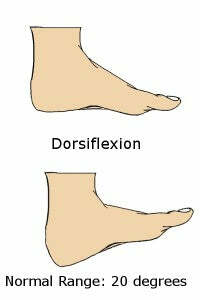 Dorsiflex the big toe to lengthen PF if it is tight. Get out of heels – gradually – in ALL activities. Do not wear shoes with heels that shorten your PF and place your foot in all-day-dysfunction: wear level footwear with a wide toebox. Do some deep soft tissue work with rollers, balls, your thumbs. Practice a technique of running encouraging more natural form, lighter ground contact and loading rates, and more proprioceptive cueing. For more info check out the book titled Natural Running. Go really light and slow at first, even for weeks if condition has been chronic. Just learn good impact moderating behavior. Strengthen your big toe by pushing it into the ground as often as you can whenever you are standing throughout the day. This will wake up the foot muscles and help recreate the arch. If you first toe is bent in consider a product to straighten it like Correct toes from Dr. Ray McClanahan. Avoid NSAIDS (Motrin, Ibuprofen, etc). These drugs interfere with natural healthy healing processes. Good nutrition and avoiding inflammatory junk food and eating healthy fats is more important than most think. Custom orthotics and similar products attempt to stabilize the subtalar joint by supporting the arch, claiming to correct the poor biomechanics of the foot. This claim of correction is quite misleading. Orthotics can mask the symptoms by artificially supporting a dysfunctional structure along with its inherent muscle imbalances, while introducing a new angle of ground interface to the foot. In most cases, the artificial support provided by orthotics has little or no effect on the alignment or structural integrity and your foot will become increasingly weaker and dependent on the support. These bracing and supporting characteristics may actually prevent proper alignment in the foot and ankle as they manage multi-directional activities, contributing to increased stresses at the ankle and knee. And the chance of injury increases when misalignment and increased stress combines with an unlocked structure. From a biomechanical perspective, by introducing a new angle of ground interface, orthotics cause a shift in the dynamics of the repetitive movement. The symptoms resulting from the old dynamic disappear and the problem seems to be corrected. Unfortunately, over time or with increased activity levels at the new ground interface angle, the repetitive movement often results in new symptoms at different locations. This creates a recurring cycle where new orthotics are prescribed to compensate for the ever-migrating symptoms and pathologies. The current practice is to recommend new orthotics at least every couple of years. Dr. Mark Cucuzzella is a Professor at West Virginia University School of Medicine. He is also a Lt. Col in the US Air Force designing programs to promote health and better fitness in the military with the USAF Efficient Running Project. (available on iphone format here) In military and civilian community he has been a tireless promoter of healthy movement, nutritional interventions in patients with any spectrum of the metabolic syndrome, and injury free training for running .